For surfers who ride big waves, perhaps the most enticing, terrifying and humbling spot on Earth is a sunken island in open ocean 100 miles off the Southern California coast. Today it’s a hidden island, a sea mount where the ocean floor rises from a depth of 6,000 feet almost to the surface. In 1990, Dixon writes, Orange County surfers Bill Sharp, Sam George and George Hulse set out with San Clemente-based surf photographer Larry Moore from Newport Harbor in a 29-foot-long boat. 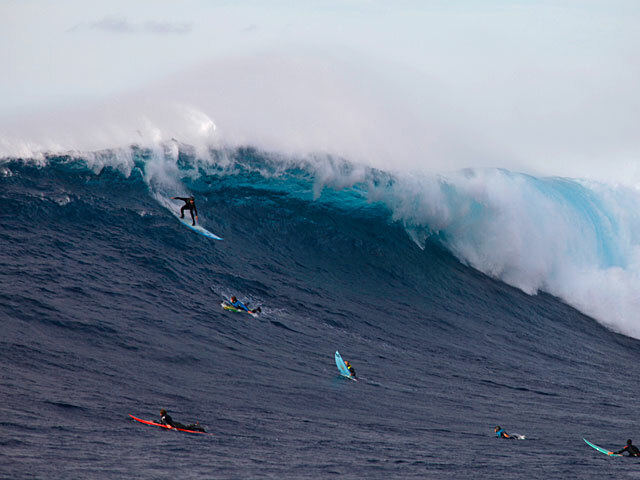 They were on a secret mission to see whether a large swell that had passed Hawaii would produce large, surfable waves at a reef that rises to within 15 feet of the surface in open ocean, marked only by a warning buoy. Now, Cortes Bank is a fickle, rarely ridden, world-famous surf spot that can be spectacular when conditions are right. Dixon, a former Orange County resident and a former editor with Surfer magazine, now lives in Charleston, S.C. He was in San Clemente on Friday to sign books and describe how the story of Cortes Bank came together. • In 1846, the crew of the USS Constitution, on its only sail down the California coast, apparently saw waves there and reported the open-ocean hazard, Dixon said. • In 1855, a clipper ship, the Bishop, may have struck the pinnacle of Cortes Bank, which became known as Bishop Rock. • In 1985, the aircraft carrier USS Enterprise hit a reef 100 miles off San Diego. Dixon later confirmed it was Cortes Bank. The book describes how, in 1985, a newspaper article about the Enterprise incident caught Moore’s attention. As Moore, then photo editor at Surfing magazine, researched the sea mount, he became convinced it had potential for surfing. In 1990, he and Cessna pilot Mike Castillo flew over the bank during a giant swell and were shocked at what they saw. Castillo turned to Moore and said, “If anyone ever tries to surf out there, they’d better take the … pope along to pray for them,” Dixon told an audience Friday at the Surfing Heritage Foundation. Jim Caldwell has over 26 years of experience in the public safety sector in occupations ranging from professional ski patrol, and ocean lifeguard to firefighter. Jim has worked for the Redondo Beach Fire Department for the last 22 years holding successively higher positions of responsibility. For the last six years, Jim has held the rank of Engineer with responsibility for driving and operating the Department’s Engines and Tillered Aerial Ladder Truck. Throughout his career, he has shown a dedication not only to public safety but also community service. This entry was posted in Big Waves, Chopes, Jim Caldwell, North Shore, Photography, Surfing, Tow-in Surfing and tagged Biggest surf spots Cortes Bank Jaws Mavericks and Nazare, Bill Sharp, Bishop Cortes Bank, Bishop Rock, Chris Dixon, Chris Dixon Ghost Wave: The Discovery of Cortes Bank and the Biggest Wave on Earth, clipper ship bishop, Cortes Bank, Cortes Bank Bill Sharp Sam George and George Hulse, Cortez Banks, cotrez banks, Fred Swegles, George Hulse, Ghost Wave: The Discovery of Cortes Bank and the Biggest Wave on Earth, history of cortes bank, history of cortez banks, Jaws, Jim Caldwell, Jim Caldwell Redondo Beach, Jim Houtz, Mavericks, Mike Castillo, Mike Snips Parson on Cortes Bank, Nazaré, Pacific's Cortes Bank is full of big-wave surprises, paddle big waves, paddle cortes bank, paddle cortes banks, Sam George, Sean Collins on Cortez Banks, Sean Colllins on Cortes Bank, Surf Photography, surf photos, surfing big waves, tow-in cortez bank, tow-in cortez banks, tow-in surfing, towin cortes bank, USS Enterpise hits reef of San Diego. Bookmark the permalink.